Door stops, door holders, door silencers and door hinges for commercial, residential wood or metal doors. 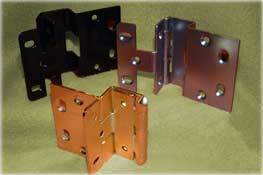 Hardened pivot pin and large four hole mounting plate insures years of life. Base material is cast brass. All mounting hardware is included. height is 3-3/4". Wall clearance is 3-1/2" strike projection is 2-1/8"
Base of high dome is .5"